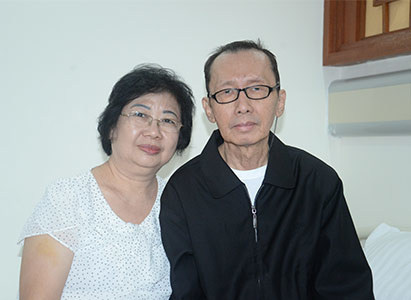 RIFIN WINATA OEI, 65 years old, comes from Jakarta, Indonesia, was diagnosed with liver cancer in Penang in 2013. He summarized his course of disease in a word: regret. During the past 20 years, RIFIN WINATA OEI drank a lot every day, because he couldn’t sleep without alcohol. Actually, the liver cancer RIFIN WINATA OEI got can be traced. RIFIN WINATA OEI was diagnosed with hepatatrophy in Beijing as early as 2013, doctor exhorted him to stop drinking, stubborn as RIFIN WINATA OEI, he did not pay attention to it and kept drinking. Later, RIFIN WINATA OEI started to have pain in his liver, but he insisted on drinking rather than taking examinations in a hospital. Finally, RIFIN WINATA OEI was confirmed to have liver cancer in a regular physical examination. The tumor was in a small size when diagnosed. Doctor in Penang suggested him to take surgery and explained to him that it was only a small surgery, but it turned out that part of his liver was cut to remove the tumor during the surgery. RIFIN WINATA OEI felt part of himself was emptied; he couldn’t walk farther, couldn’t carry heavy things. However, the tumor relapsed after 9 months, RIFIN WINATA OEI had to take surgery again to cut off his liver. Unfortunately, his tumor still recurred after two session of surgery. After two session of surgery, RIFIN WINATA OEI became weaker and weaker. He could not walk and sleep. He was told that one could not live long once he was diagnosed with liver cancer. His friends and relatives suggested him to take cancer treatment in Singapore or famous hospitals in Indonesia, but he was so desperate that he refused all their suggestions. Fortunately, there is always a way out, one of his friend recommended him St. Stamford Modern Cancer Hospital Guangzhou in their most desperate moment. At that time, free cancer symposium was held in Jakarta by MCHG to help more cancer patients, a stage 4 liver cancer patient shared his anticancer experience on the symposium. Encouraged by his wife and daughters, RIFIN WINATA OEI decided to try again and take cancer treatment in China. RIFIN WINATA OEI was too weak to walk when he was hospitalized in MCHG. He couldn’t eat, as a result, his weight lost from 65 kilograms to 37 kilograms and had to have intravenous injection everyday to maintain nutrition. Upon admission, the multidisciplinary team of MCHG quickly made him a treatment plan due to his precarious condition. RIFIN WINATA OEI was first given liver protecting drug, then natural therapy and cryotherapy. After the first session of treatment, RIFIN WINATA OEI took other comprehensive treatment includes interventional therapy, biological inmmunotherapy, chemotherapy, etc. After several sessions of treatment, his tumor shrank from 13cm to 4cm; he is able to walk again; his appetite and sleeping becomes normal. RIFIN WINATA OEI’s wife told us happily that RIFIN WINATA OEI used to be pretty desperate, at that time he couldn’t eat and walk; but after taking treatment in MCHG, he looks much better, he is able to walk and eat, his weight increases and become much optimistic. When RIFIN WINATA OEI and his wife returned to Indonesia, their friends and relatives visited him and was surprised by his improvement. They thought it was incredible, even some doubted it. 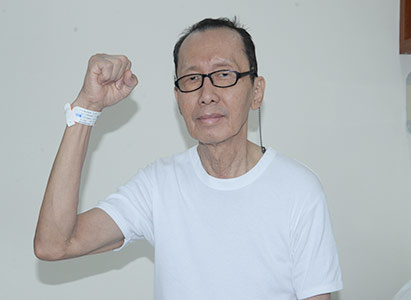 RIFIN WINATA OEI told them that he took cancer treatment in St. Stamford Modern Cancer Hospital Guangzhou and himself is the best evidence of its advance medical technologies and cancer treatment. Doctor in a Penang used to told him that he could only live no more than 6 months. However, one year passed, RIFIN WINATA OEI’s condition is becoming better and he now regains hope after taking treatment.